Spring is such a fun time for kids. They are finally able to get outdoors and play without worries of snow and ice. So to celebrate spring this year, I thought that I would share a list of things that your kids will really enjoy. Your little ones will love all of these 20 fun and creative DIY spring garden crafts for kids. All of them are super fun and many of them are so easy that your toddlers can do them on their own. 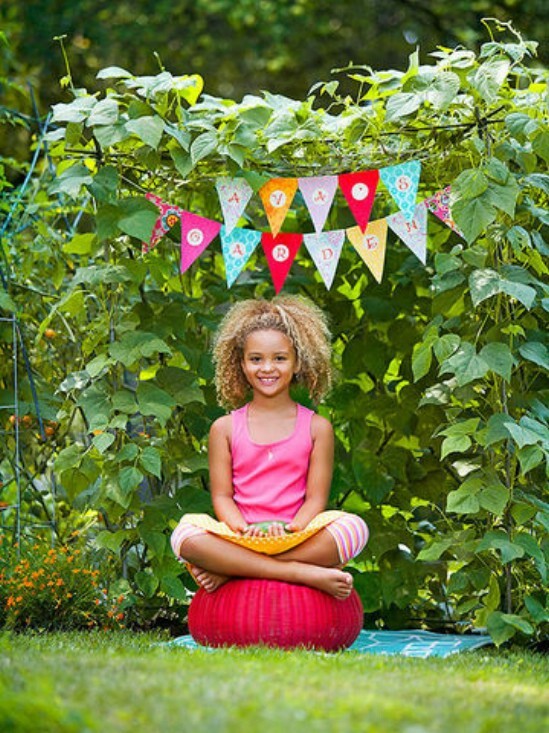 If your kids love gardening, this is the perfect collection of DIY ideas. 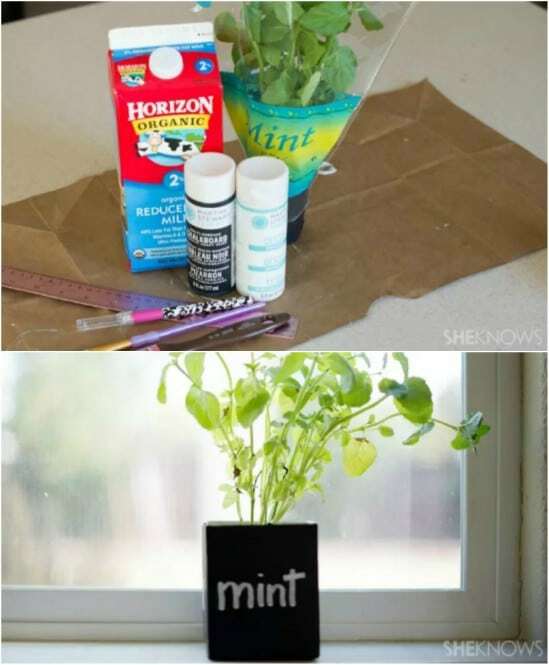 If they don’t love gardening, you can teach them to with these craft projects. Either way, they are going to have a blast outdoors making all sorts of fun gardening projects. Some of these can be done indoors and used for indoor decorating so they are perfect for those rainy days when kids still can’t get outdoors. And, if your kids really love being outside, you have to check out these 30 DIY outdoor play areas to keep them entertained all summer long. 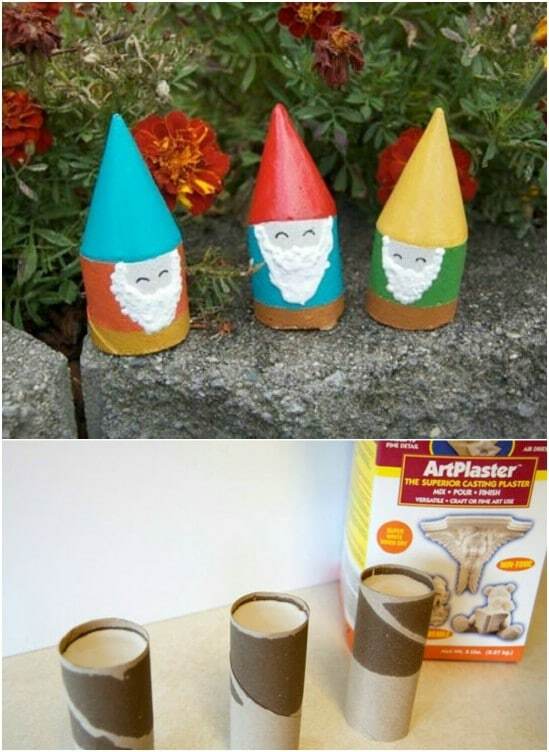 From adorable fairy houses to homemade garden gnomes, your kids are going to adore each and every one of these DIY spring craft projects. There is even a cool terrarium that they can plant and grow themselves and a DIY chia pet. Remember chia pets when you were a kid? Your kids are going to love this DIY version just as much as you loved yours. And, if the weather doesn’t permit outdoor crafts, you should be sure to share with them these 60 best Disney crafts for kids. They are definitely going to want to make every craft on this list! 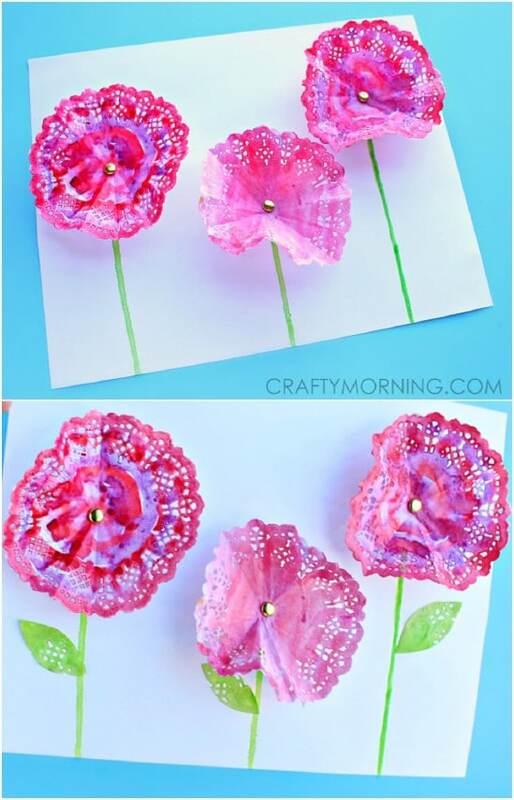 Kids are going to love making these adorable little 3D flowers from doilies. These are super easy, even for toddlers and preschoolers, and it is a wonderful way to teach kids about flowers and plants. You make these with paper doilies that the kids paint whatever colors they want. They can turn their doily flowers into cards, bouquets or great little refrigerator magnets! What kid doesn’t love playing with bubbles? 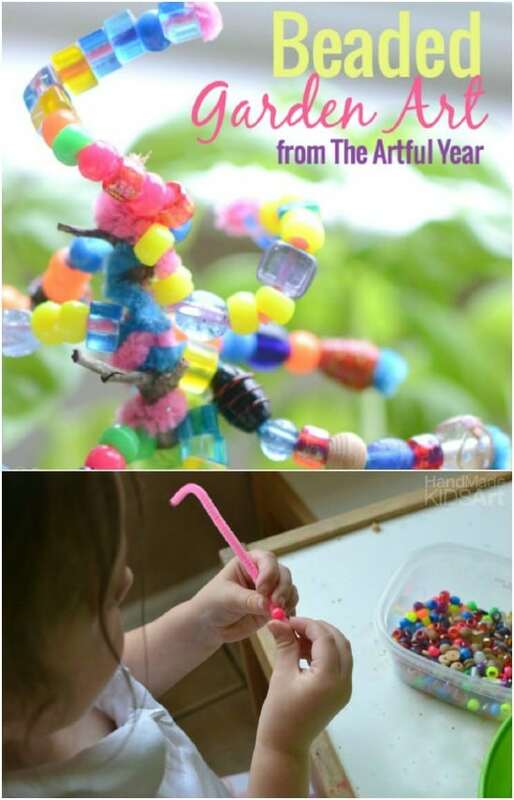 These DIY beaded bubble wands are the perfect spring project if your little ones love making bubbles in warmer weather. The beads are so colorful and they make huge bubbles – depending on how big you make the wands, that is. You can make this even more fun with your own DIY bubble solution. You could even use this to make giant homemade bubbles that will really thrill your little ones. Even your toddlers will love creating this gorgeous DIY beaded garden art. You just need a collection of plastic beads in different colors and some pipe cleaners to make these. Kids can choose their own designs and create all sorts of flowers, butterflies, dragonflies, or other garden creations and then “plant” their art right there in the flower garden for everyone to admire and enjoy. Kids are going to love helping you to make this paint and they will love using it even more. 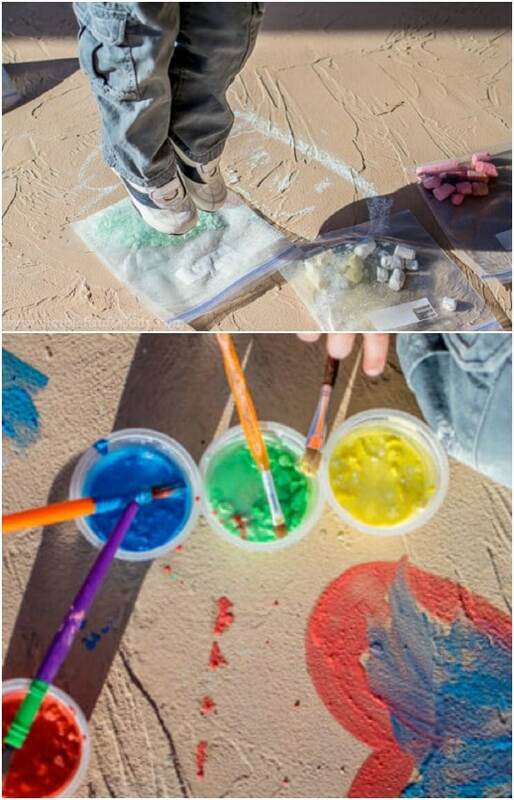 Let them create lovely spring scenes on your walkway or driveway with these DIY chalk paints, that you can make from regular chalk sticks and some water. This is a really easy project and when you have the paints, your little ones can create all sorts of garden art for the front yard. 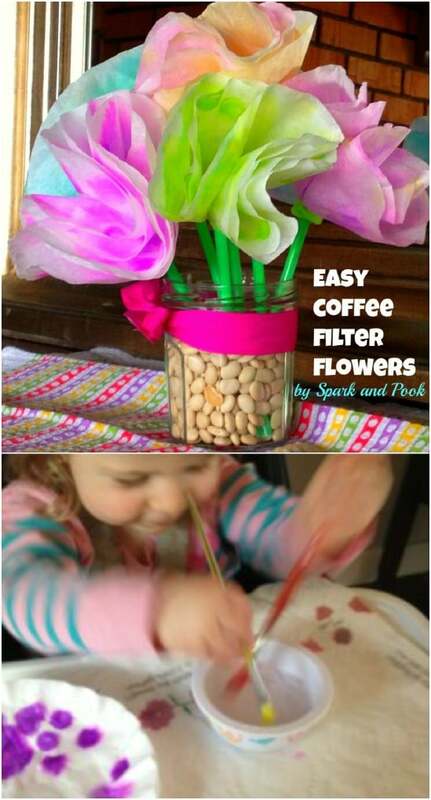 Let your kids help you to get ready for spring by making these adorable little flowers from coffee filters. They’re so colorful and they can use them to decorate in so many ways. This is a great opportunity to teach your little ones about how flowers grow and give them a fun and creative craft project at the same time. 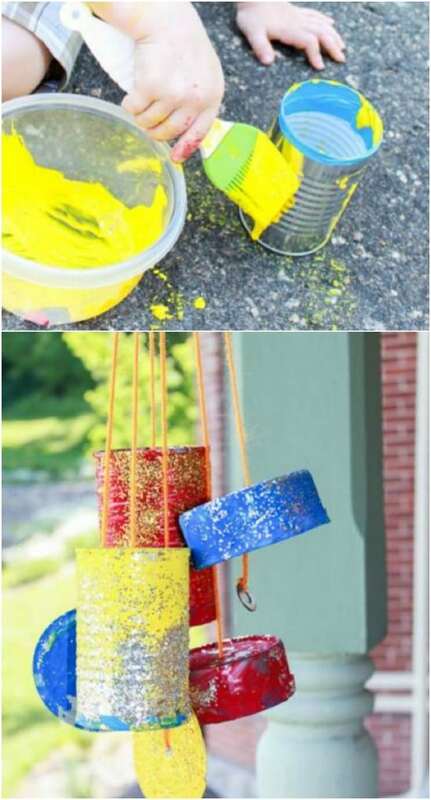 Kids will love making their own windchimes and they can make them from empty tin cans. This is a great way to upcycle those tin cans and you can use cans of all sizes from tuna to canned veggies. Just let them paint the cans and then decorate them however they want. They can tie them all together with rope or twine. You could have all sorts of DIY windchimes hanging from your porch! 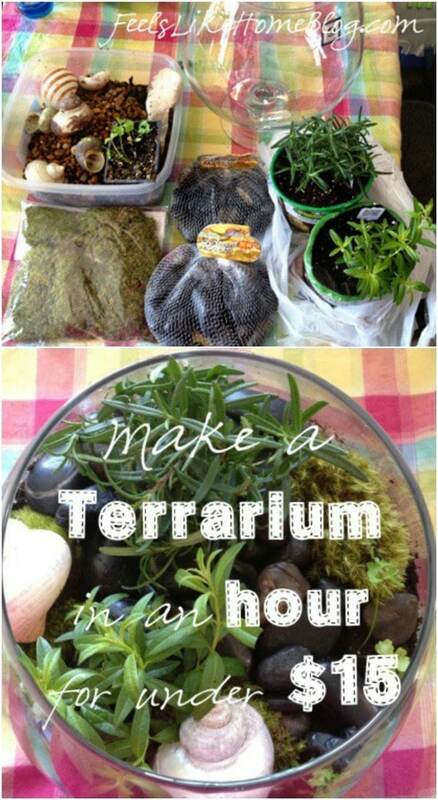 You can spend less than $15 and have everything that you need for your little ones to make their own DIY terrariums. Just a glass or quality plastic fishbowl and a few succulents are needed for this easy DIY kid friendly craft project. They can learn so much about planting and they can display their pretty little terrariums indoors or out. Plus, if they plant herbs, they can harvest those herbs as they grow and learn even more about the planting process. 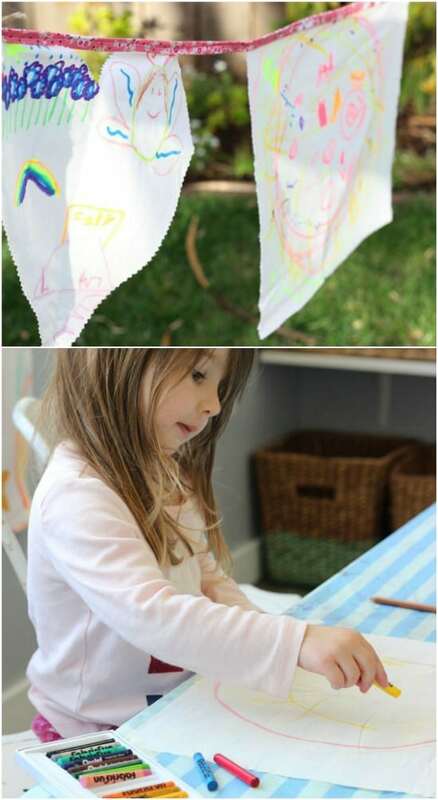 Garden flags are a wonderful way to decorate your lawn and garden and these are super easy for kids to make. You need some white cotton fabric for this one. If you have it on hand, this is a great way to use up some of that scrap fabric from other projects. You also need a few other basic craft supplies. Kids design their flags however they want and you can help them to sew their flags together. 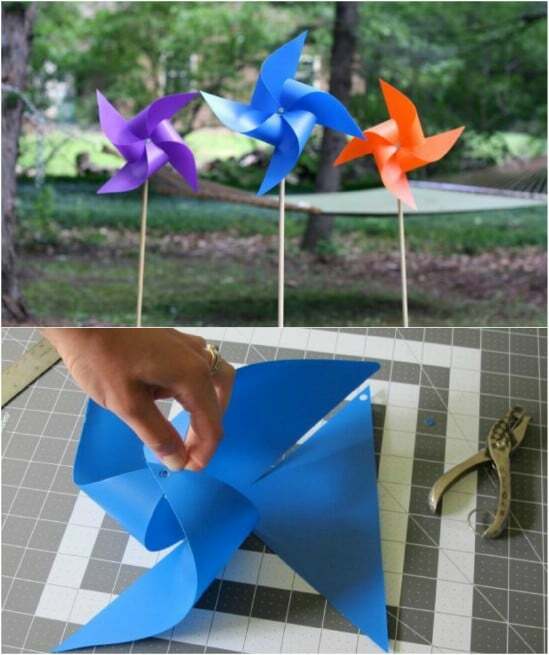 These pinwheels are perfect for adding some color and fun to your outdoors and kids will love making them as much as they love watching them spin. You can make these from plastic file folders. Depending on your children’s ages, you may need to help them with cutting the plastic. Once that’s done, they can form the pinwheels and add the dowel rod so that you can stick them in the garden. Suncatchers are perfect for spring. 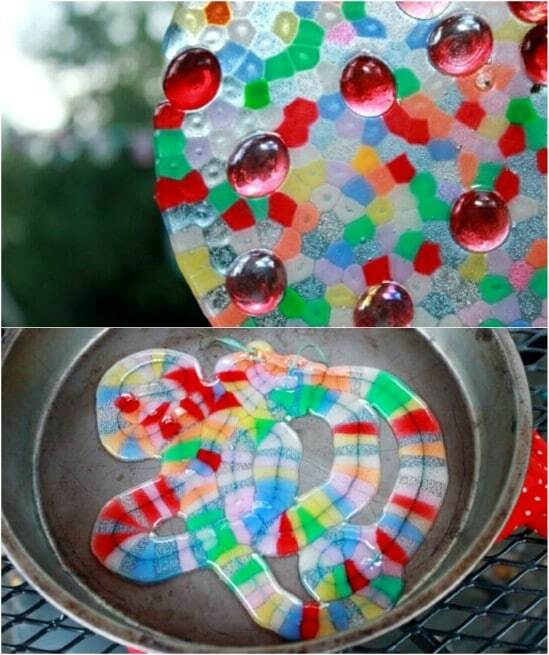 They are so colorful and kids will adore making these DIY melted bead suncatchers and hanging them outdoors. These are made by using metal cookie cutter molds and plastic beads – which you can get really cheap at Walmart. These are so much fun to make! 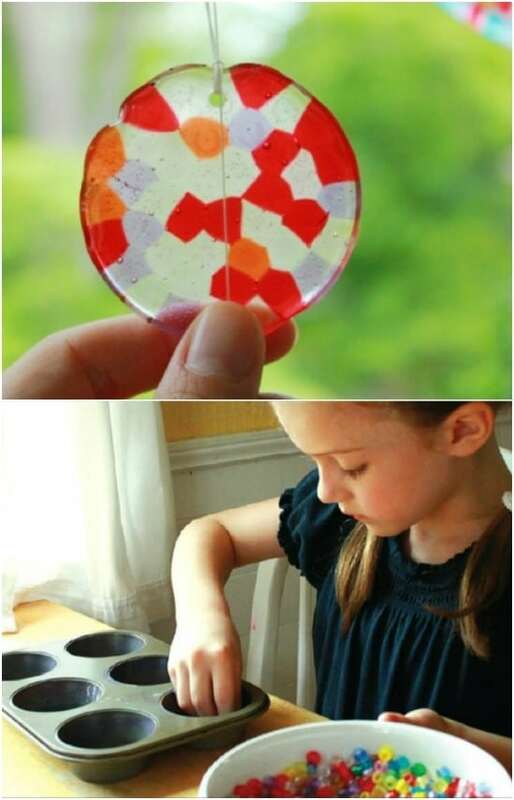 Kids will adore making their own designs and then seeing their suncatchers when they’re all finished. I love projects that let me use up something that I would otherwise throw away. 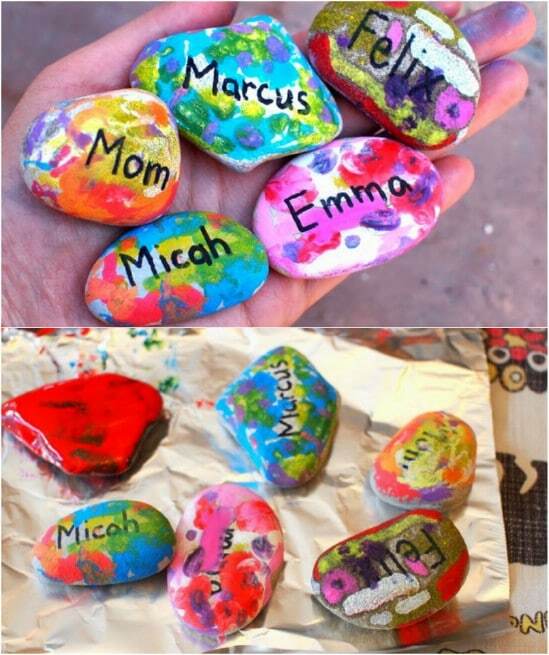 These little decorated rocks are made with melted crayons, so they give you a wonderful way to use up those old broken crayons and give the kids a fun garden project. Let them decorate all sorts of rocks that will in turn decorate your garden. These little rocks also make wonderful DIY gifts for gardeners like grandparents or teachers. 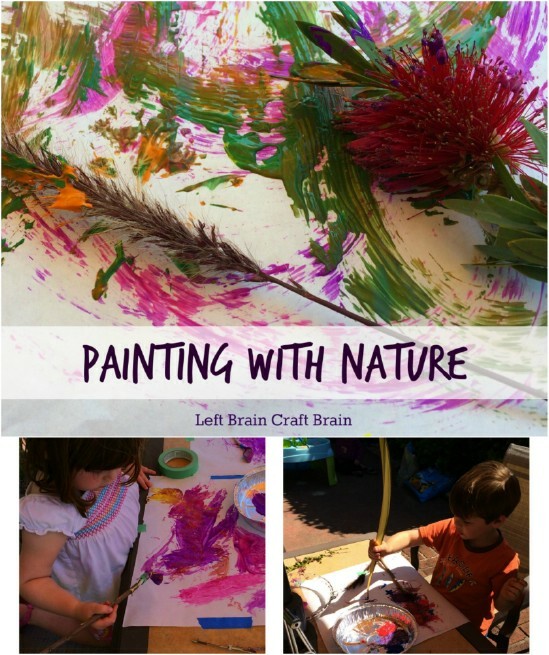 Help your kids to really learn about gardening and nature with this fun nature painting project. They paint their own artwork by using leaves, flowers and other things found in nature. Once that art is finished, you will have beautifully colored pieces to hang all over the house and your little ones will love creating them – this is a great project for outdoors when the weather warms up. Here is another wonderful way to introduce your little ones to nature. 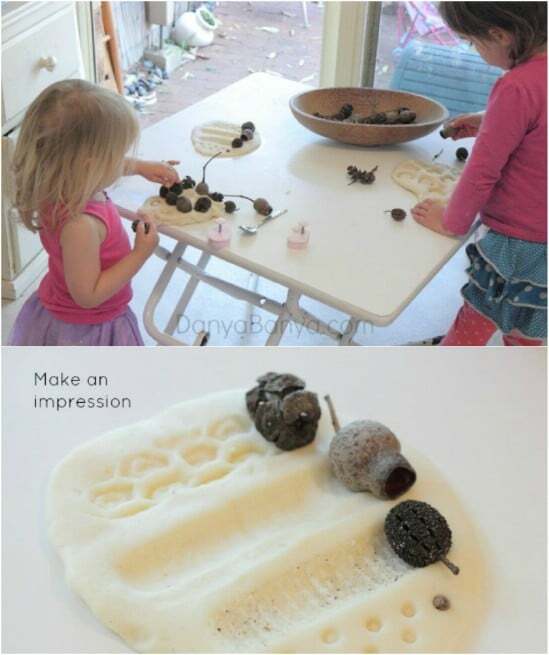 Make some DIY playdough and have the kids stamp things into it that they find in the garden or lawn. They can use acorns, leaves, blooms or just about anything that they can find outside and once the playdough dries, they have a permanent little ornament to remind them of their nature craft. Kids love watching their own plants grow and this DIY chia pet is sure to thrill them. 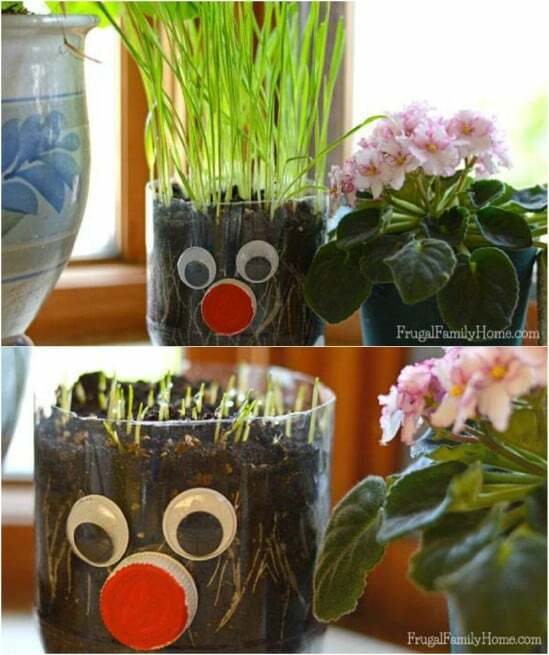 If you want to teach them about gardening, this is a great way to do it and you get some whimsical décor at the same time. You help them to create their chia pet face with an empty two liter bottle and they can decorate it into any character that they want. Then, plant chia or wheatgrass seeds to create the “hair”. 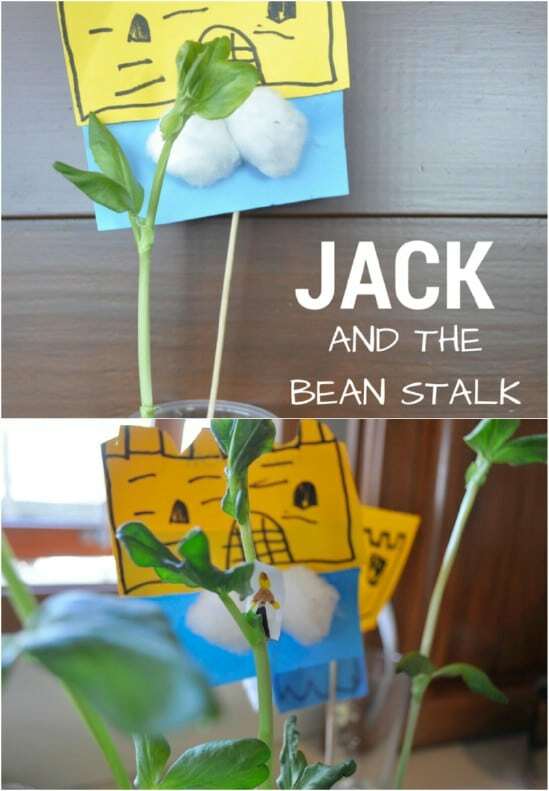 Jack And The Beanstalk is a favorite children’s tale and your little ones will love making their own version of the story. For this spring garden craft, you just have them draw and then cut out a “Jack.” Then, you plan a beanstalk and be sure that Jack is climbing it as it grows. They will have a blast seeing how high Jack can get as their bean plant grows taller and taller. You just have to remember growing your very first plant in a milk carton! Help your kids to have that same excitement with their own milk carton planter. This is a wonderful way to teach them about gardening and to give them something to be responsible for. They will need to water their little plant regularly to see it grow. And, when it’s ready, they can transplant it into the garden and really watch it grow. Certain bugs and critters are actually good for your garden. Teach your children about beneficial insects with this cute DIY ladybug hotel. They can make this with the base of a birdhouse and then just fill it with bamboo and top it with moss. 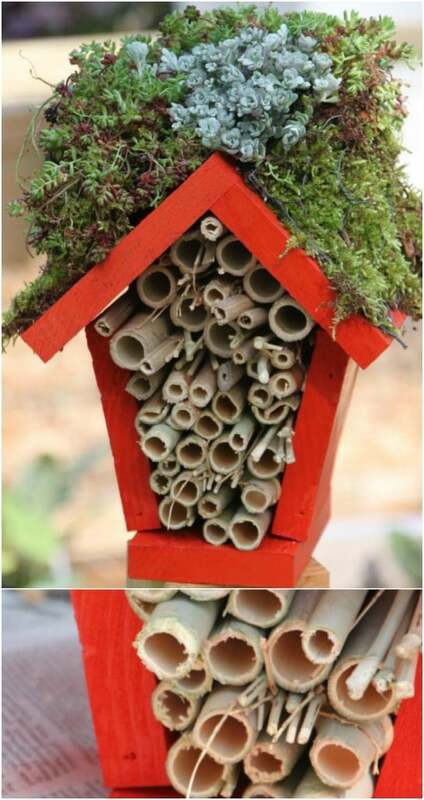 They will have a blast creating their own little hotel and they will really love watching the ladybugs flock to it this spring. Teach your kids about planting and when those plants grow, they will have a great little clubhouse. This string bean hideaway is just that…a hideaway made from string beans. You just support the beans as they grow and turn them into a great little cover for their clubhouse. Kids can create banners and all sorts of other fun things to include and they will be right there in the clubhouse when it comes time to pick the beans! 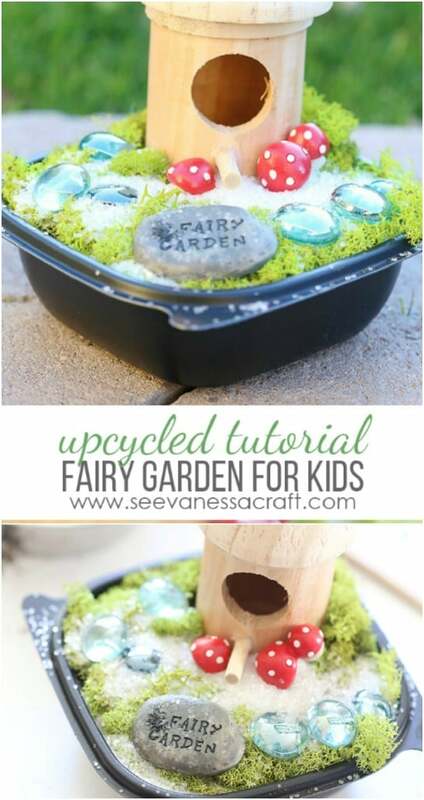 Kids love fairies and they will especially love making their own fairy garden. DIY fairy gardens are so much fun to create and you can help your little ones to create all sorts of DIY fairy garden furniture and décor to help decorate their little homes. Once the fairy garden is finished, they can put it right there in the flower garden or anywhere that you have space and show off their little fairy homes. Give your kids something fun and creative to do and they will give you something colorful and adorable to add to your garden! These little mini garden gnomes are so much fun to make and they are perfect for decorating your flower bed. You make them from plaster, and you can create a homemade mold so they’re really inexpensive. Once they’re done, just let the kids paint and decorate them. Very cute String Bean Kid’s Hideaway, That was a great idea and a lot of inspiration. My son would love to make these thanks.